He was accompanied by Nasser Lootah, Executive Vice President of Generation at Dewa, Mansoor Al Suwaidi, VP for Projects, Dr Maan Alafeefi, VP of Commissioning, and Masoud Kamali, Project Manager. Since 2015, Dewa has been working with Siemens on the Jebel Ali M-Station expansion, and had appointed Mott MacDonald as the project consultant. The combined total cost of the construction and expansion of M-Station, equipped with the latest smart devices and sophisticated heavy-duty technological systems, is close to Dh11.5 billion ($3.06 billion). According to him, M-Station’s current total capacity is 2,185 megawatts (MW) of electricity and 140 million imperial gallons of water per day (MIGD). The station also operates at the highest levels of availability, reliability, and efficiency, and uses the most advanced technologies in the world, he stated. The expansion project includes new power generation units, with an added 700MW capacity, to the station’s current total, said the Dewa chief. 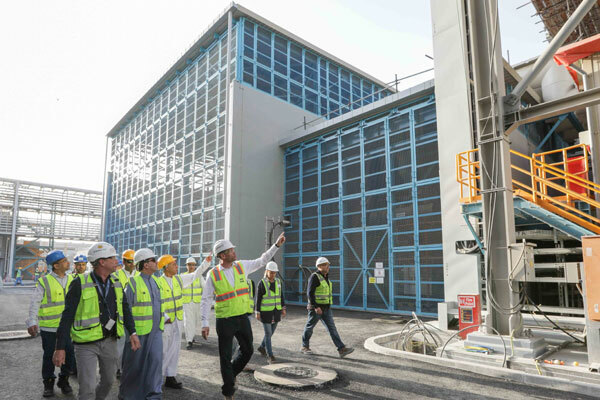 Al Tayer pointed out that the expansion project has added two dual-fuel gas turbine generators, two heat-recovery steam boilers, and a steam turbine that is 90 per cent fuel efficient. This will increase the plant’s thermal efficiency from 82.4 per cent to 85.8 per cent, which is one of the highest thermal-efficiency rates in the world, he stated. When completed, the project will increase the station’s total capacity to 2,885MW, he added. M-Station was built at a cost of Dh10.15 billion, and Dh6.2 billion were invested to generate 2,185MW of electricity from 6 Siemens F-model gas turbines, each with a capacity of 255MW; 6 boilers for waste-heat recovery; and 3 steam turbines, each with a capacity of 218MW. Dewa said the project has been implemented in phases since mid-2010. Water desalination systems, costing Dh3.95 billion, use 8 desalination units, deploying Multi-Stage Flash (MSF) distillation technology, each with a capacity of 17.5 MIGD and totalling 140 MIGD, two dual-fuel-fired auxiliary boilers of 390 tonnes per hour, and 16 fuel-oil storage tanks, each with a capacity of 20,000 cubic metres, with total fuel-oil storage of 320,000 cu m.